Summon: Give another friendly creature power and health equal to Ambitious Hireling's power. 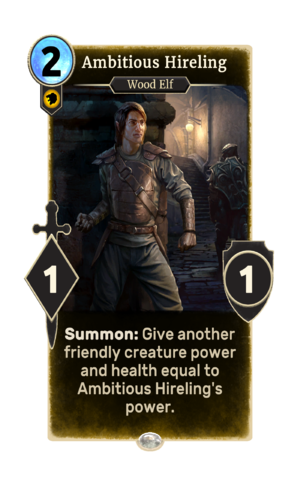 Ambitious Hireling is a common Willpower creature card. It is part of the Houses of Morrowind expansion. "I just want a chance to prove myself." This card's ability applies the Ambition card effect. This page was last modified on 27 February 2019, at 23:58.